This is an amazing property right in the center of Ojochal. It’s almost 100 acres of open rolling pasture with internal roads. There are patches of jungle throughout the property, several springs, and an amazing river with easy access full of waterfalls and swimming holes. The property is less than 5 min from the center of Ojochal which is full of great restaurants and bakeries. 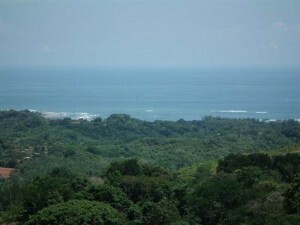 It is 10 min from the paved highway on 2 wheel drive roads and 15 min from the nearest beach! The ocean views are outstanding. If someone wanted to do a development there are easily 20 large ocean view building sites that could all have a shared river access. This would also make a great property for a private estate or a small self sustainable community.